The go-kart has its roots in America but this sport is extremely popular throughout the world. The thrill of an open-wheel car racing around in an exciting circuit surely increases the adrenalin levels of the drivers and viewers alike. Go-kart racing is fun, competitive and no two experiences will ever be the same. It is a sport enjoyed by all, irrespective of age. In the category of kids’ goods, go-karts and dune buggies are soon becoming popular. These machines, which spell speed and excitement, are a great way to let your children experience some racing action. The speed aspect of go-kart racing is what draws people to this sport but one must not forget that it is very important to be safe. This Razor GO Kart makes racing a breeze, literally, due to superior design. It is smooth to drive but still quite powerful. The safety aspect has been well taken care of in the design of this go-kart. It has bucket seats, shoulder and seat strap as well as a safety flag. Design: The design of this go-kart is based on the original Ground Force design and it is electrically powered. Speed: It can run up to 12 miles an hour at variable speed and it has a chain-driven motor with high torque. Great looks: The frame of the Razor GO Kart is made of steel and the front wheels are made of molded aluminum with solid tires for super drifting. Acceleration and brake: The thumb operates the acceleration and the rear brake is hand-operated. Seat: The seat of this go-kart is a bucket seat with the seat and shoulder strap both and it makes it extremely safe for kids. Battery: It can be used for 40 minutes continuously per charge and it has a 24V sealed lead acid rechargeable battery system. 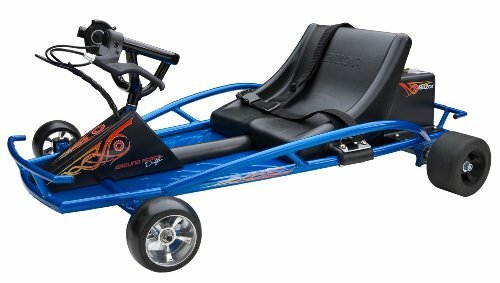 Recommended age: The recommended age for the Razor GO Kart is for kids eight years and older. For all the kids who love to do a little driving around on their own, the Razor Dune Buggy is the perfect choice. It is easy to use, fun to drive around in and also very safe. With its wide bucket seat and strap, kids can enjoy driving this around easily as it rides great and smooth over grass, cement and asphalt. Electric design: This dune buggy has a fully electric design and requires two 12V sealed lead-acid batteries and charger to last for 18 hours. Speed: It can run up to 9 miles an hour and it has a 350-watt motor with variable speed. Acceleration and brake: It has a thumb trigger for acceleration and hand throttle and brake controls. Seat: The seat on this dune buggy is a wide and comfortable bucket seat with strap and a safety flag. It also comes with a side roll cage that acts like a barricade. Tires: The 8 inch knobby pneumatic tires gives great control with safety. Recommended age: The recommended age for this dune buggy is for kids eight years and older. Does your kid like the outdoors and has been very curious watching you drive? Then the Power Wheels Dune Racer would be a great toy for your kid. It features a Monster Traction system that makes it easy to drive on all kinds of terrain with ease. It’s sturdy, safe and great features will make your kid love the outdoors even more. Driving system: The Power Wheels Dune Racer features the Monster Traction drive system which makes sure that you will not get stuck even if you are driving on any kind of surfaces. These surfaces can be wet grass, hard surfaces, rough terrain and even tree roots, garden hoses or edges of the driveway. It also comes with the Power-Lock brake system. Speed: This dune racer has two forward drive speeds, 2.5 mph and 5 mph and it has one reverse speed, 2.5 mph. Design: The steel frames make the dune racer sturdy and safe. It also has metal sidebars for support and Velcro seat belts. Battery: It has a 12V rechargeable battery and also includes the charger. Recommended age: The recommended age for this go-kart is for kids between three and seven years of age. Being the top three products in the category of go-karts and dune buggies, each of these products has some special features. With so many options available in the market today, let us see what advantages each of these products have in comparison to its competitors. Battery operated: Since this Razor GO Kart is battery operated, you can easily just plug it in and charge it. Easy maintenance: This go-kart is easy on your pocket too since it is an electric one and hence low maintenance. Low-to-ground feature: This feature makes it safe for kids as it prevents the go-kart from flipping over easily. Low speed with safety: Since the speed limit on this dune buggy is up to 9 miles per hour, it makes it extremely safe compared to some of the other models available today. Superior tires: The air filled tired make riding this dune buggy very easy as it steers well and it rides great on almost all surfaces. Versatile: The Power Wheels Dune Racer runs on almost all surfaces comfortably. It runs well on grass, concrete and rugged terrain too. It is also great when climbing slopes or going through rubble, sand or gravel. Stable: The steel frames of this dune racer make it a very solid and stable product and since it has a low design it is nearly impossible to turn over when in use. Safe: It has a number of safety options such its two speed options, its Power-Lock brake system and parental-control high-speed lockout, which make is very safe to drive around. 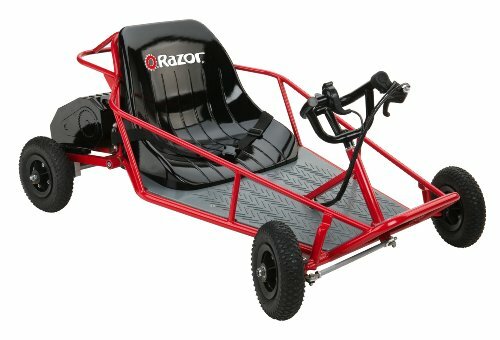 The Razor GO Kart review has very high ratings and positive feedback. One major reason for this is the Razor GO Kart price, apart from all its great features. It is competitively priced and for all that it offers you, some users may find the Razor GO Kart cheap and an absolute steal. The Razor GO Kart website also offers you an early bird Razor GO Kart discount and in case you miss that, you can avail of the Razor GO Kart coupons. It is a great product for your kids and they will love to try out some power sliding with all the necessary safety and security that comes with this Razor GO Kart. If you are looking for a cheaper, faster go-kart but with a higher maximum weight limit then the Razor Go-kart is the one. You should keep in mind that the Razor Go-kart works best on flat surfaces and only takes about 4-6 hours to charge. However if you are looking for a slightly costlier dune buggy that can be used on almost all surfaces, then the Razor Dune Buggy should be your choice. Also it has a maximum weight capacity of 20 lbs. lesser but is fitted with pneumatic tires for extra grip. It takes about 12 hours to charge. 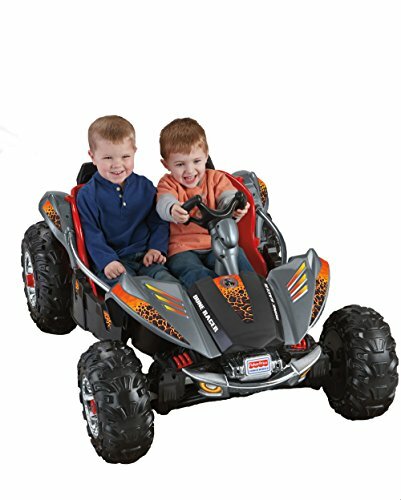 The Power Wheels Dune Racer is one of the most popular battery driven ride-on toys in the market today. Its driving system and safety features make it a great electric car for kids. Its versatility and high quality have earned it great ratings and reviews from users. If you have been looking for a fun and safe toy and which would be great for your kids to experience some driving action, then the Power Wheels Dune Racer is the one for you.